Transfer from Antalya airport is one of the most important issues for the Turkish tourism industry. Because each year, over twenty million eager holidaymakers flock to Antalya for their summer holiday. This means that, during peak times, Antalya airport becomes extremely busy. Therefore, having your transfer from Antalya airport pre-booked can mean the difference between a stressful or a relaxed start to your holiday in Turkey. Just outside the Antalya airport terminal, your professional driver will be welcoming you with a smile. Bizim Transfer, offers cheap airport transfer from Antalya to Alanya. we provide airport transport to everywhere in Alanya. whether you are going to the most touristic resort in Alanya or in a small village in Alanya. You can book shuttle transfers or private transfer web page. If you cannot find your address, you can call us 24 hours to ask anything to us. You can contact us via WhatsApp, Viber, Facebook, live chat and telephone. For our contact details please click https://www.bizimtransfer.com/contact-uss Please check our Alanya transfers price list as below. With plenty of low-cost Antalya transfer options, from private taxis to shuttles and more besides, booking with is the smart choice for reaching your destination completely hassle-free. Antalya Airport shuttle bus transfer is the cheapest way to your hotel or home. Whether you choose an Antalya taxi transfer or a shared shuttle, we'll get you where you need to go with a smile on your face, so you can start enjoying your holiday as soon as possible. Antalya is the gateway to some gorgeous Turkish seaside resorts. With rich culture and history, as well as its heavenly Mediterranean climate and turquoise waters, the resorts around Antalya, such as the popular holiday destination of Marmaris, can provide the holiday of a lifetime. The seaside resort of Kemer features natural, unspoiled stony beaches which demonstrate Kemer’s attractive natural beauty, that is also visible in its sea, forests and the Taurus mountains that rise to peaks of 2200m nearby. Enjoy the bars, clubs, and restaurants of the marina, as well as the beaches, watersports and the wide range of activities on offer. Kemer is just 42km from the airport, though no standard shuttles run to Kemer. A pre-booked transfer is vital. 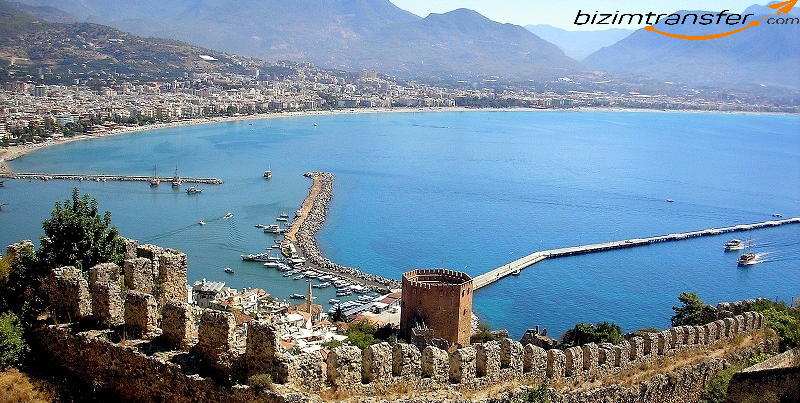 Alanya is two hours from Antalya airport and boasts Lara and Konyaalti beaches which, with their rocky beauty and crystal clear waters, provide a very authentically Turkish landscape. There are plenty of fantastic resorts close to Antalya, which itself is a vibrant and beautiful location in which to holiday. With a great quality airport transfer booked, you can begin enjoying the wonders of this amazing part of Turkey as soon as you get off the plane. my favorite holiday destination is Alanya. Take your shared shuttle from Antalya Airport starts your holiday earning!